There are thirteen working distilleries in Scotland that are part of the 200-year club. That’s like the mile high club of Scotch, just much rarer and a wee bit cooler. And it just so happens that the most recent inductees–both celebrating their bicentennial in 2015–are two iconic Islay producers: Ardbeg and Laphroaig. The other Islay member of the 200-year club is Bowmore, by the way, which was the second inductee and is a geezer of a distillery by any definition. But, 200 years is no small feat. The world has changed many times over in two centuries. There have been wars, dictators, inventions, 41 US presidents, you name it. Whisky has gone in and out of favor dozens of times. Yet through it all, these 13 distilleries have continued to produce whisky, year after year (well, minus most of the 1980s in Ardbeg’s case, but we’ll let that one slide). To celebrate this monumental achievement, Ardbeg is releasing two limited edition commemorative whiskies. 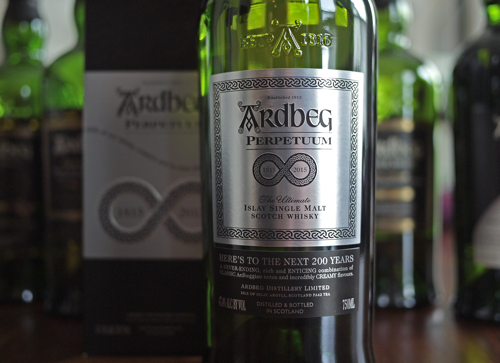 The first of which, Perpetuum, is this year’s annual Ardbeg Day release and it just hit the shelves in the US. The second whisky hasn’t been officially announced yet, but it is rumored to be a special 30+ year whisky (according to the Summer 2015 issue of Whisky Advocate). 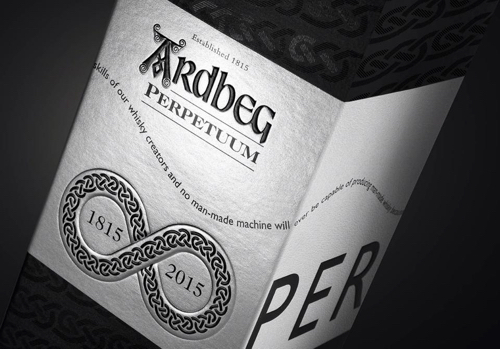 So, what makes Perpetuum special enough to carry the distillery’s 200th anniversary emblem? 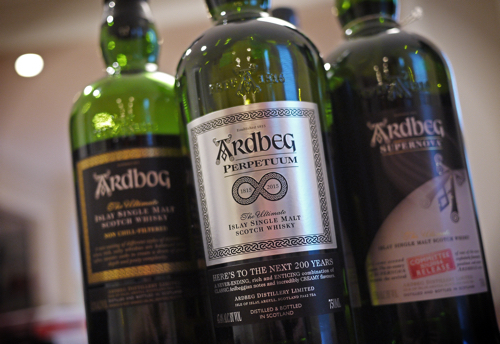 Well, Dr. Bill Lumsden (Head of Distilling and Whisky Creation for Ardbeg) acknowledged that he took inspiration from the different styles of Ardbeg that have been made over the past two centuries to create this new whisky. The final spirit contains a mix of different ages and casks (bourbon and sherry), including a small amount of some very old Ardbeg malt—perhaps some of the oldest currently available—as well as some very young malt. In the words of Ardbeg, this is “The past, present, and future in a glass.” So, basically, Perpetuum is the Christmas Carol of whiskies. Or, perhaps, Scrooged, if you’re more into 1980s Bill Murray. This is a very lightly colored whisky; pale straw yellow. The peaty nose also has a lightness too it that I find intriguing. Perhaps delicate finesse is the better word. It’s a peaty perfume with flower, salty ocean waves, and olive. For the ladies, I would definitely recommend a dab of this behind your ears. With a little water, a smoldering campfire erupts, with some eau de fresh tennis balls. The 47% is disguised in a silky robe of smoke, with the initial peat giving way to some rich chocolate and fruit on the mid palate, and a hint of sherry (and really, it is just a hint) that gets quite nutty and spicy on the finish. There’s salty brine and smokey bacon, as you’d expect, but there’s also this very mellow, but pronounced, undertone of vanilla and resin that carries into a tremendously long, oily finish. Next ArticleBrooklyn and Chicago Take Boston, and a Free Pair of Tickets!